Image | This entry was posted in Safety, systems thinking and tagged root cause, safety. Bookmark the permalink. There was no written text concerning the myth of root cause, no matter what link I clicked on. Unless you read the current safety thinkers, you’re not going to know this RCA is a myth. Thought it would be worth a write up, since it so fundamental and has been traditionally used for so long. Dr. Hollnagel’s article and now his new book have a section on this. Although, the quasi-scientific community may say this is hand waving by social scientists. It’s amazing what we all thought was true is unfounded in any stringent argument, i.e., lots of items to deconstruct by social constructionism. A quick perusal up on the website for safety consultants finds most of them based in the safety myths–say us. Hmm. I read a lot of the current safety thinkers, as well as some of the classics… and I see this attitude of “no such thing as a root cause” as being a bit too eager to discard old for new, even when some of the old, established ideas still have some value. I contend that the concept of “root cause” is one of those still-valuable ideas, even for the analysis of complex systems. Maybe I have to discard traditional notions of cause-effect in some cases. Perhaps I need to change some of the details in my definition of “root cause”. It may be that I’ll have to use a different set of tools, methods — even mental models — to gain the insights needed to propose meaningful improvement actions. Any “root cause” (or causes) that I identify might be stated in completely different language and involve factors that are completely foreign to traditional root cause analysis. Even with all those modifications, the concept of a remote cause (set of causes) that may be fundamental to a problem, or a whole class of problems, and which identifies a point of leverage from which improvements (in reliability, resiliency, safety) can be driven, still has merit. Why throw out the baby with the bathwater? Thanks for the reference; I’ll check it out. I have researched causality fairly thoroughly over the years; one reference that I liked a lot was Judea Pearl’s book (http://www.amazon.com/Causality-Reasoning-Inference-Judea-Pearl/dp/052189560X). I also like the following exploration of causal models from the epidemiologist’s perspective (https://www.kent.ac.uk/secl/philosophy/jw/2008/cits/Parascandola%20Weed%2001%20-%20Causation%20in%20epidemiology.pdf). Now, I have seen this conjecture before, that the notion of root cause crumbles due to complexity, emergence, causal loops, etc etc. However, I’ve never seen this statement proven, or even convincingly justified in abstract… maybe if you only consider ancient ideas — domino theory? really? — then the notion of “root cause breakdown” might be valid. However, why assume that *all* root cause analysis practitioners are stuck in the 19th century? Just to clarify… I do consider causal loops, feedback mechanisms, and the potential for emergence whenever I see a system that appears to be on the verge of passing from “merely complicated” to “characterized by complex behaviour”. In order to do that, I often have to go up and out, in and down, left and right, etc. There is no single way to do this, there is no master toolset, there is no fixed liturgy that determines how I shall conduct an investigation. I’ll happily use any tool I can find that will give me additional insight into how a system operates. I am always after that “richer picture”. I just don’t see how or why the concept of root cause is considered to be diametrically opposed to systems thinking. Don’t make the mistake of taking the analogy of a “root” cause too seriously. In systems, “root” just means “fundamental”, “important”, “performance shaping”, “high leverage”. Well it all rather depends by what you mean when you talk about root cause, but much is defined by the techniques people use in practice (and which can be sold to generate income). On your site you mention that “(RCA) it is probably the only way to find the core issues contributing to your toughest problems”. There is of course a long conversation there…but I think you probably use a variety of approaches to fit the situation and system. If you are working with a mechanical system, then the concept and methods associated with ‘root cause’ might be of particular value. In human and sociotechnical systems it is rather different, but may be have be used/adapted to understand interactions between system levers and any emergent patterns. Your stance appeears to be pragmatic, which is fine; then it is about understanding the trade-offs that one is making, how and why. Perhaps we are in general agreement about most things; I suspect we are, given what I’ve read on your blog (excellent, by the way). 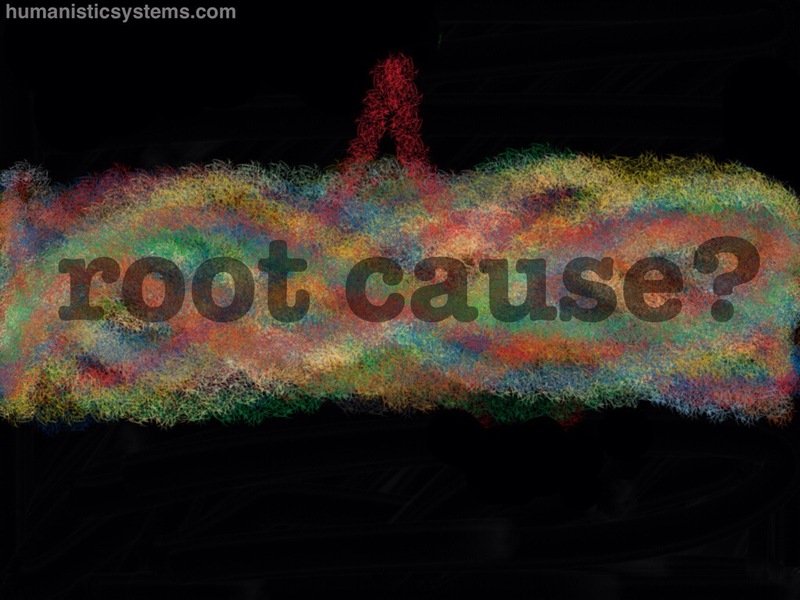 The main difference may simply be that I continue to use the term “root cause”, while you do not (if you ever did). For me, the definition of “root cause” stopped being “original cause for a non-conformance, that, if removed, prevents recurrence” about 15 years ago. My current, preferred definition is the following. Thanks for the thoughtful conversation! That is a useful adaptation which again is pragmatic, which is usually necessary to compromise and progress. I have a similar approach, e.g. for incident, where wholesale rejection lf existing approaches would not work practically, but an adaptation and compromise does. In the end, it is a case of choosing a mindset for a situation or need, but not getting taken hostage by it. And thanks to you also Bill.